Protecting Mote Park - not only its pleasant surrounds and wildlife, but as a healthy resource to adults and children - entails more and more work each year. 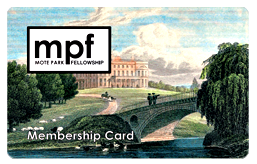 A Mote Park Fellowship membership card offered to all associate members. Our volunteers put in hundreds of hours each year but there are some things that only money can buy. We rely on memberships to help continue our conservation and preservation work within Mote Park. For only £20 a year (£14 for concessions), you can join us as an associate member of the Mote Park Fellowship. To show you just how important your donation is and how it is used, you will receive all of the benefits below. Even if you only visit the park a few times a year, our membership card can easily pay for itself. All members receive a 10% discount in the Café In The Park. Even as an individual, this can help save you money through regular visits! The discount applies to all food and drink excluding confectionery and ice-cream. All members receive a 20% discount code used with telephone bookings for the Segway experience with Segway Events. Normally open to those aged 55+, members aged 50+ can dine at the Romney Restaurant & Bistro in style and receive a 10% discount. The perfect way to end a day at the park. The Mote Part Watersports Centre operates on the lake within the park and runs a wide variety of activities including boating and scuba diving. All members can receive a 50% discount on all course bookings. Our bat walks are very popular and always sell out fast. Taking place in the evening, they involve the tracking of bats using radar to learn about their night time habits. Members go free with a paying adult. Our history talks are a great way to learn more about the history of Mote Park from one of our local experts. Members go free with a paying adult. You will be invited to join our committee meetings should any significant discussion or vote be taking place outside of our AGM. All members are invited to join in, or just sit in, on our Annual General Meeting where we discuss the groups position, its achievements for the year gone and what we hope for in the coming years. Events hosted in Mote Park can offer us free tickets to our members to help support our group. Members will automatically be entered into these draws to win pairs of tickets. Each quarter, we'll send you a newsletter on what we've been up to and we plan to get up to! Our newsletter is a great way to keep in touch with ongoing projects, how you can help and what events are going on in the park. Lastly, but certainly not least, as a member you are playing a supporting role in the conservation and protection of the environment within Mote Park. It should not be underestimated just how vital a role you play by joining as a member. To pay by cheque, simply download our membership form, enclose your payment and return it to the address specified on the form. The easiest way to join is to use our form below. The cost is a minimum price; please add to this amount should you wish to make an additional donation.